Maybe you would like to rent a bicycle? Most likely not this time, but BikeForMe offers you an opportunity to invest your money and generate profits from bicycle renting industry. BikeForMe is interesting Golden Stage project with $400 investment, and it is monitored here on DavidNews.com since the end of February. It has an interesting legend, and it caught my attention right away. It seems that BikeForMe owner is one of the rear HYIP owners that can think out of the box and seems that he is more creative than 90% of the industry. Usually and also this time I like such projects, and I'm not afraid to say few good words about them. This project is clearly unique and well done despite that legend, and everything is not typical like in most of HYIP projects. I like that on the website there is a lot of video content, but greatest thing of all that is that investors do most of this content. It is great thing simply because it is something like "next level marketing" where investors are generating advertisement content and as you know if you hear something from some person that you know you treat this information with way bigger value. Overall of course project is not that different than any other HYIP, and there are several similarities that you can spot right away. For example, in numerous positions on the website, you will notice last activities in the project what is a very positive thing because you can follow what is going on in the project. Of course simply sitting next to the project would be a not very smart thing, but the overall image you can get for sure. I'm sure the thing that interests you the most is investment plans. There is only one investment plan that project offers and it pays 3% daily for 50 days. I'm sure that there is no need to do calculations to understand that in these 50 days you will make 50% profit. So, if you will invest $100, you will make $150 return. Simply as that. In this project, you will be able to spend with Perfect Money, Payeer, Advanced Cash and the most popular cryptocurrency Bitcoin. The positive thing is that all payments will be processed instantly and that simply mean that once you order a withdrawal, you will receive money in your e-currency wallet within few seconds. As you see, generally speaking, I'm very positive about this project, and I believe that it can and will grow bigger. 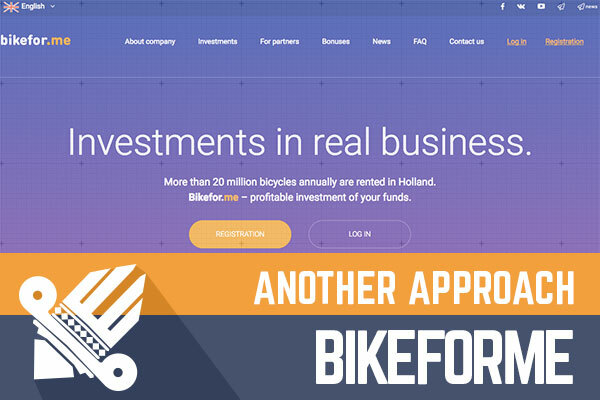 Of course, how long BikeForMe will last I can't say for sure because the project is not fresh, so if you invest than take in mind that you are not jumping in like a first investor. Also, remember the golden rule - invest less than you can afford to lose. If you're searching for the best bitcoin exchange service, then you should choose YoBit. Have you ever consider maximizing your free satoshi collections by utilizing a BTC FAUCET ROTATOR?